Mothering is a major theme in Scripture. And when God takes a mother’s barren womb and makes it fruitful it is particularly celebrated. There are several notable examples of this throughout the Bible, but two that are interesting to compare and contrast can be found in the books of Judges and 1 Samuel. They are the stories of the miraculous conceptions and callings of Samson and Samuel. These two are especially interesting to compare because they lived around the same period of Israel’s history. In fact, many scholars believe that Samson and Samuel were contemporaries for at least a portion of their lives. As one might expect, they hold several remarkable things in common. However, there are some striking differences as well. Each of the mothers of these two Jewish heroes was unable to conceive a child (Judges 13:2; 1 Samuel 1:5). Therefore each of the pregnancies came about as a miraculous intervention from God (Judges 13:3; 1 Samuel 1:20). Both babies were sons, and each of them was consecrated to God for service (Judges 13:5; 1 Samuel 1:28). Each of them grew up and led Israel, and each was referred to as a “Judge” (shofet). Samson is the last ruler to be called a judge in the book of Judges. Samuel is the last ruler to be called a judge in the Old Testament. But that is perhaps where the similarities end. The conception of Samson was preceded by a spectacular visitation to his mother from the angel of the Lord, who gave her instructions for setting apart the child for service to God (Judges 13:3-5). The angel had an appearance that was “very awesome” (v. 6). When Samson’s mother told her husband about the visitation he prayed that God would allow the angel to come to them a second time and give them the instructions again (v. 8). When the angel appeared the second time Samson’s father, Manoah, asked him to stay so that they could prepare a meal for him (v. 15). Interestingly, the angel was willing to stay even though he would not eat the goat they had prepared (v. 16). When Manoah asked the angel his name he replied that it was beyond understanding (v. 18), and then he ascended to heaven amid the flames of the fire (v. 20). In contrast to the spectacular circumstances that surrounded the conception of Samson, the conception of Samuel seems meager. Hannah was not only barren, she was also mistreated by her husband’s other wife (1 Samuel 1:6). The other wife would provoke Hannah to a point until she wept and would not eat (7b), a mistreatment that continued “year after year” (7a). She was so distraught over her barrenness that when she finally went to the Lord’s house to pray for God to intervene she wept so bitterly (v. 10) that the priest accused her of being drunk (vv. 13-14). She eventually was able to explain that she was not drunk, but the only priestly compassion she received was a fairly tacit prayer about God granting her what she had asked (v. 17). Nonetheless, Hannah was encouraged (v. 18) that the Lord had heard her prayer (vv. 19-20). It is perplexing to figure out why Hannah had been encouraged. While Manoah’s wife had heard the proclamation of the angel of the Lord (twice no less), Hannah was given nothing of the sort. Even the priest who said, “may the God of Israel grant what you have asked of him” had seemed so disingenuous that one would hardly describe his ministry as priestly. She had been promised nothing. Yet, Hannah “went her way and ate something, and her face was no longer downcast” (v. 18). In each of these two stories we have a miraculous life that came about as a direct result of the hand of God. Does that sound familiar? It should. Each of us has at some point experienced the conception of divine life in our soul. That is how God came to live within us. All of us have that in common with both Hannah and the wife of Manoah. However, after those similarities we can be divided into two camps. There are those of us like the wife of Manoah, who had the divine life conceived in us amid spectacular circumstances and unlikely signs from heaven. And then there are those of us like Hannah, who went our way no longer downcast despite a lack of spectacular signs and a meager beginning. We see this when we start talking about sharing our testimonies, telling our stories. Some are eager to talk about God’s spectacular display of intervention and proclamation. But some of us are not sure that there is a whole lot to talk about. Some of us feel like God picked us to do great things. But some of us feel like we kind of talked God into it. Here is the truth about comparing and contrasting the mothers of Sampson and Samuel. While both of these miracle lives were created, set apart, and called by God from the very beginning, they each had drastically different endings. Sampson started out strong, but by the end he had become a tragic tale of the cost of compromise. Samuel started out meager, but by the end he had become an incredible example of the promise of probity. Sampson was consecrated by the Spirit in the womb of his mother. But by the end of his life the Lord had left him and he did not know it (Judges 16:20). Samuel could not recognize the voice of the Lord in the beginning. But by the end God did not let any of Samuel’s words fall to the ground, and all of Israel recognized that he was a prophet of God (1 Samuel 3:19-20). All of us are here only by the divine intervention of God. Sometimes there are those that appear to have more spectacular beginnings than the rest of us. However, our lives will not be measured by how they began, but by how they end. Neither of these two mothers can take credit for divine life that was conceived within them, but perhaps they played an important role in how things developed from there. And perhaps that as why we know Samuel’s mother as Hannah, but Sampson’s mother only as the wife of Manoah. 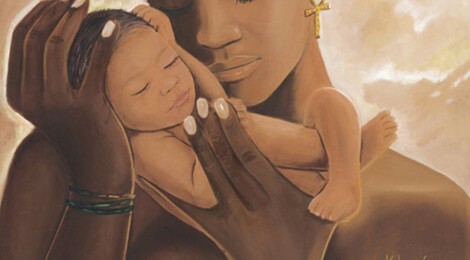 Two mothers, each carrying divine life within them. Just like you. Just like me. So, in the end, which mother will you turn out to be? Oh my! This is extremely thought provoking. You brought out things I’ve never considered. Makes me know I need to keep praying and covering my children in prayer.